This article is shared to help people convert JVC Everio HD video camera recorded files—.MOD/TOD extension files to the regular videos, so we can easily put them on the iPod, iPhone, Sansa, iRiver and other portable devices, and share them on Youtube, ,my space, etc with the help of Mod converter and Mac Mod Converter. Preparation : Free download 4easysoft Mod Converter and install it. Step 1: Run 4Easysoft Mod Converter and load your Mod/Tod files. Step 2: Setup the output profile and the output file path. 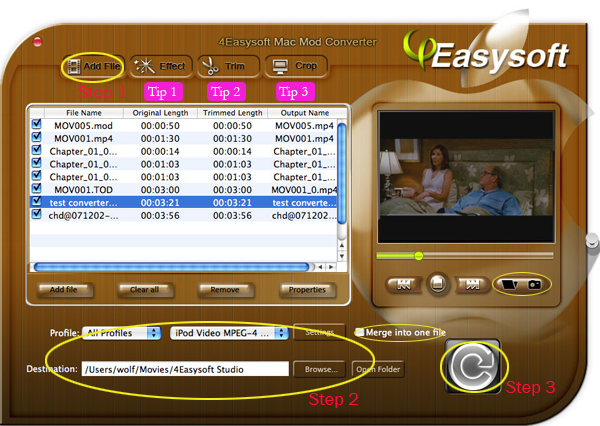 With this powerful converter, you can convert Mod to WMV, Mod to 3GP, Mod to FLV, Mod to iPod,etc. 1. Effect—adjust your video brightness, saturation and contrast according your preference. 2. Trim—get any part of your video to convert. 3. Crop—get your players suitable play region video. Preparation : Free download 4Easysoft Mac Mod Converter and install it. Step 1: Click “Add File” button, you can add the files that you want to convert. Step 2: Set output settings. From the profile drop-down list, you can choose the output format you want. Click the “Browse” you can choose the output destination. Step 3: Click “Start” button to begin the conversion. 4. Merge—enjoy a long video from several clips. 5. Snapshot—capture any image you like in the videos. Try now! Hope this is helpful!